Why are Pixar films so often at or near the top of annual best-picture lists? Because, we say with some exasperation, nobody these days makes better movies. With each iteration, John Lasseter and his gang of divinely arrested preadolescents find new solutions to the eternal artistic challenges of storytelling, to the mixture of comedy and angst. Given the unprepossessing subject matter  a second sequel about a collection of playthings  director Lee Unkrich and writer Michael Arndt have confected a powerful fable about needy wage slaves wedded to their servitude because it creates a sense of community more liberating than freedom. 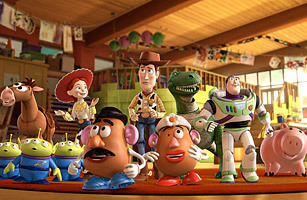 Right through its incendiary and genuinely emotional endgame, Toy Story 3 teaches morals of holding and sharing and personal responsibility to the greater social good. But the movie's most important lesson is for Hollywood: Watch this and see how it's done.